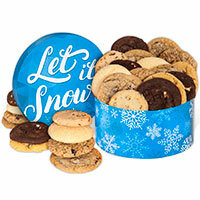 The Let It Snow Cookie Gift Box is an fabulous way to put a smile on someone's face during the winter months! The bright blue box comes filled with an assortment of Gourmet Gift Basket's most delicious freshly baked cookies, including chocolate chip, fudge brownie, peanut butter, pecan sandy, and more! If they're living in a snow globe, this gift box full of fresh cookies is sure to warm their heart and their belly! The cookies are all soft and delicious. Believe me, I tried all of them. I could not help myself. I had to at least give each one a taste test for this review. These are some of the best cookies I have ever had. Seriously. They rival my homemade cookies, which I must say are some of the best cookies around. So if you want to say if with love, say it wtih cookies! Just make sure the person you are buying the gift for is not allergic to any of the ingredients first. You can never be too careful these days. Everything in the box is Kosher. These cookies and other gourmet gifts can be purchases from www.gourmetgiftbaskets.com. Like Gourmet Gift Baskets on Facebook:https://www.facebook.com/GourmetGiftBaskets; Follow Gournet Gift Baskets on Twitter: @gmtgiftbaskets; Follow Gourmet Gift Baskets on Pinterest:https://www.pinterest.com/giftbaskets/ and Follow Gourmet Gift Baskets on Instagram: https://www.instagram.com/gourmetgiftbaskets/.